The cosmic velocity web is represented by surfaces of knots in red and surfaces of filaments in gray. The black lines with arrows illustrate local velocity flows within filaments and toward knots. 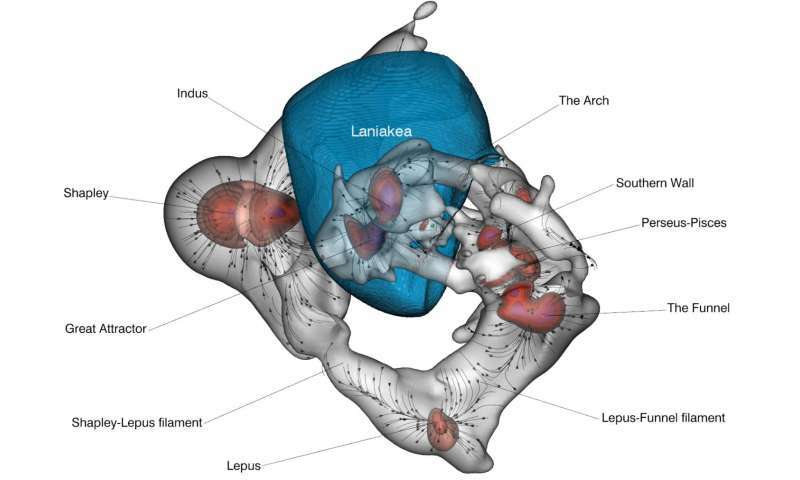 The Laniakea Supercluster basin of attraction that includes our Milky Way galaxy is represented by a blue surface. The region being displayed extends across one billion light years. Credit: Daniel Pomarede, Yehuda Hoffman, R. Brent Tully and Helene Courtois. Credit: Daniel Pomarede, Yehuda Hoffman, R. Brent Tully, Helene Courtois. The cosmic web—the distribution of matter on the largest scales in the universe—has usually been defined through the distribution of galaxies. Now, a new study by a team of astronomers from France, Israel and Hawaii demonstrates a novel approach. Instead of using galaxy positions, they mapped the motions of thousands of galaxies. Because galaxies are pulled toward gravitational attractors and move away from empty regions, these motions allowed the team to locate the denser matter in clusters and filaments and the absence of matter in regions called voids. The cosmic velocity web analysis was led by Daniel Pomarede, Atomic Energy Center, France, with the collaboration of Helene Courtois at the University of Lyon, France; Yehuda Hoffman at the Hebrew University, Israel; and Brent Tully at the University of Hawaii's Institute for Astronomy. The 3-dimensional map can also be explored in an interactive visualization, using the free online Sketchfab platform. This is a powerful tool to visualize interactively the structure from any viewpoint and compare it with the distribution of galaxies; one can dive inside the filaments and explore them in immersion. With appropriate virtual reality hardware, it can also be used in VR mode. This visualization marks a milestone as the first time such an interactive dataset will be embedded in the online version of the scientific article appearing in the Astrophysical Journal. Everyone is invited to interact with the data below, or at https://sketchfab.com/models/754cb85550fb42588175f8a215718521.